Designed for small paving jobs and are primarily used to economically restore asphalt and concrete surfaces. 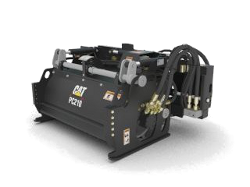 Ideal for milling imperfections prior to resurfacing, removing deteriorated pavement, removing traffic lane stripes and jobs where the use of dedicated planers is limited. Automatic self-leveling when placed on the ground for consistent depth control without operator adjustments. Two wear resistant skid plates remain parallel to the ground for optimum stability. Hydraulic side-shift allows close planing to curbs, walls and other obstructions. Independent left/right depth control allows maximum drum depths to be adjusted independently on each skid.